While I’m immersed in the cold and snow upon my arrival back home for the holidays, my mind is elsewhere, lost in a warm, tropical paradise—coconut paradise, to be exact. I made macaroons the other day, and eating them reminded me why I love them so much. It also made me wonder why I haven’t made them at any other time throughout the year, since they take no time to make and only use 4 ingredients, all of which I always have in my pantry. If you’re a fan of coconut, I seriously urge you to give these a try if you haven’t already. 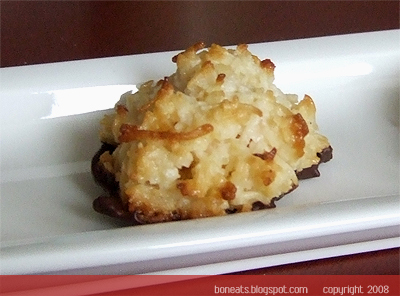 The recipe calls for condensed milk, which gives the macaroons both their sweetness and divine chewiness. I like using unsweetened coconut so that my macaroons don’t become cloyingly sweet (the condensed milk will make them sweet enough, trust me! 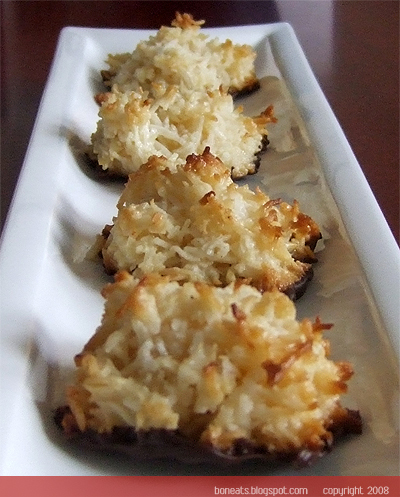 ), and the addition of the almond extract gives the macaroons a nice, nutty hint working in the background. Dipping them in chocolate not only makes them look pretty and gift-ready, but they also balance the sweetness of the coconut beautifully. I’ve tried a version using egg whites once, and it had nothing against these ones. 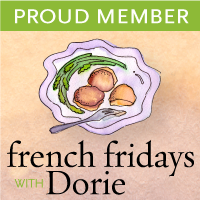 The egg white versions just don’t yield the same kind of texture and chewiness that is so distinct and so beloved in a coconut macaroon (at least in my coconut macaroons). Best of all, the condensed milk version is so simple. All you need is a bowl, a spoon and baking sheets and you’ll instantly have macaroons on your table. These are delicious and addictive, so if you plan to give them away, it’s best to keep them hidden from family members! Preheat the oven to 325°F. If your baking sheets aren’t nonstick, line them with parchment paper and set aside. In a large bowl, combine the condensed milk, vanilla extract and almond extract. Stir until well combined. Add in the coconut and stir until everything is incorporated, and all the coconut is moist and coated with the condensed milk. Using a dessertspoon, place heaping, rounded spoonfuls of the coconut mixture onto the baking sheets. Bake in the oven for 10 to 12 minutes, or until golden-brown around the edges. Remove immediately and let cool completely on cooling racks. In a double boiler, melt the chocolate chips. Dip the bottom of each macaroon in the chocolate, using a small palette knife to help smooth the surface by scraping off the excess chocolate. Place on a baking sheet or a cooling rack, inverted, to allow the chocolate to cool and set completely, at room temperature. Posted by Bonita at 1:33 p.m.